Registration is now open for our information and networking session "CONNECT" event on Tuesday 17th February from 4pm to 6pm. All of our PhD students are co-sponsored by industry, which means each individual PhD project benefits from both academic supervision and strong involvement of industrial partners. Do you have a research challenge or idea but lack the expertise or resource? Would you like to have a PhD student dedicated to a topic relevant to your business needs, and supported by a world-class training scheme? Does your company want to invest in future talent for your sector? CONNECT will allow companies to find out about our unique PhD programme, discuss areas of interest and expertise with our academic staff and learn about how your company can benefit from co-sponsoring a PhD student. Attendees will be asked to provide a 5 minute pitch about their company or sector and, either what they are looking for or, what they can offer. This will be followed by time for discussion and networking to broker companies with academics to identify complementary research interests. Our postgraduate students undertake a company-led design project each year. These are self-contained small R&D projects that are carried out for about 10-12 weeks and we are looking for projects to be worked on from mid-January to mid-March. Working in teams of 3 or 4 our students liaise with companies as if they were their consultants and work closely with them to a set of milestones and deliverables. This is a good platform to test-drive some concepts that you might want to explore. Please contact Donna Palmer if you are interested and want more details. 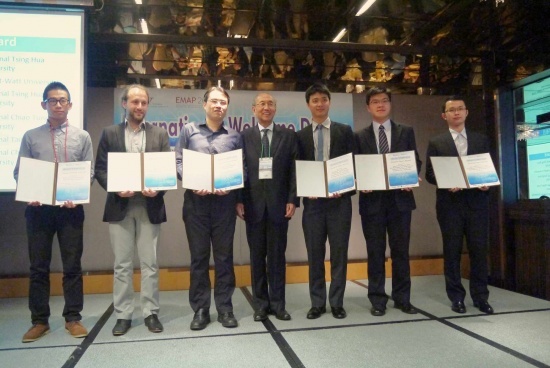 Dr. Giuseppe Schiavone, second from the left in the photograph, was awarded best paper award at the latest conference IMPACT-EMAP 2014 held in Tapei, Taiwan, on the 24th of October 2014. The conference is one of the most important events in Asia in the field of Microsystems, Electronic Materials and Packaging. The $3,000 cash price rewarded the work carried out by the team led by Prof. Desmulliez, Director the Microsystems Engineering Centre at Heriot-Watt University, for the development of an electroplating process for Galfenol, an alloy of Gallium and Iron, which has remarkable magnetostrictive properties. Only three research groups in the world have managed to electroplate such an alloy. Devices made of Galfenol offer interesting energy harvesting as well as communication properties. The work is to be continued through the Company Renishaw in the context of a fully funded PhD studentship under the CDT in Embedded Intelligence. More information about IMPACT-EMAP 2014; the 9th IMPACT (International Microsystems, Packaging, Assembly, Circuits Technology) Conference and the 16th EMAP (International Conference on Electronics Materials and Packaging) Conference can be found on the website. Dr Carmen Torres has recently been elected as a member of Council of the European Confederation of Junior Enterprises (JADE), which is the largest young entrepreneurial network in Europe, and a think tank to the European Commission in Youth and Entrepreneurship. There are only 5 Council members elected and Dr Torres is delighted to be given this privileged opportunity. Dr Torres has said “The tenure will be 2 years and I am looking forward to supporting them with strategic planning and inter-country relationships.” The network involves European Public Institutions, Universities and Private Sector Companies from more than 15 countries across Europe. To find out more please visit their website (www.jadenet.org). 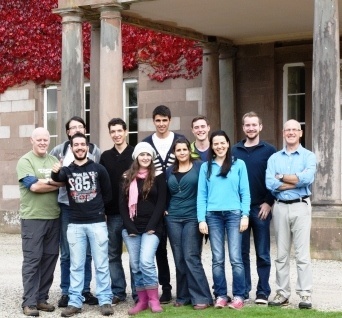 Ahead of starting their training at Heriot Watt University our first cohort attended our induction week during September 2014. The idyllic location was The Burn, a study centre located in a 200 acre estate at the foot of Glenesk on the southern edge of Aberdeenshire. The induction programme was designed to welcome and facilitate the ‘transition’ the cohort into our CDT and prepare them for the next four years. A new EPSRC Centre for Doctoral Training (CDT) in Embedded Intelligence at Loughborough University opened its doors on 1st April 2014. The CDT, whose academic partner is Edinburgh’s Heriot-Watt University, is the first of its kind in Europe and will aim to deliver high calibre employees and smarter products to industry. The Centre is funded by the Engineering and Physical Sciences Research Council (EPSRC) who see Embedded Intelligence as one of the key strategic areas of research and development in the UK for the next 10 years.